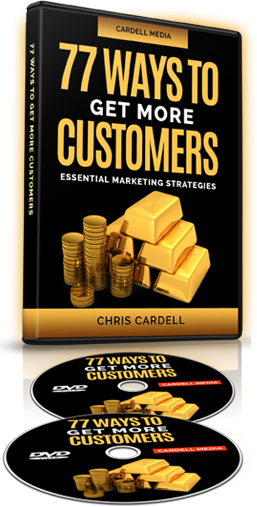 I just wanted to share this basic list from Chris Cardell’s free DVDs entitled “77 Ways to get More Customers”. This list will simply be an overview of what he talks about in his DVD, but does give many of the ways to get more customers, traffic to your website, leads, etc. It doesn’t mean that you have to use all of them. It just gives you a birds eye view of what methods you can use – and must master – overtime. I am still learning. In the DVDs he goes into each of the 77 ways in more depth. These two free DVDs are amazing and I can’t recommend them highly enough. When I watched them I listed all 77 ways as a reminder to myself. Test a daily email service. Test a tester copy on envelope. Get good at direct selling – knocking on doors. Use teleseminar and conference calls. Use conferences and trade shows. Use banner and display ads. Use Facebook adverts (50% of Facebook users spend 30 minutes a day on Facebook). Get more customers for the same or lower cost. Remove white space as much as possible on ads. Make font smaller in ads. Make compelling offers and great calls to action. Test more than one way. Use small ads in magazines. Obsess about increasing click-through rates on ads. Write separate ads and test them against each other. Combine online and offline marketing. Serve and do not sell! Cut the cost of advertising. Buy ad space just before copy deadline (day before). Use recession in your favour. Cheaper ads. Get someone to buy ad space for you. Make use of joint ventures. Become time ruthless – delegate more stuff. Use the AIDA principle – Attention, interest, desire, action. Make use of the 80/20 principle. How can I get more really good customers (20%) who make 80% of the profits. Use free public relations advertising. Piggy back off news stories. Use premium prices for more well-off customers. Make use of contact lists. Reshape the core product or service – change quality or quantity. Write and publish book(s). This creates even more authority. Just take any kind of action and implement. Don’t try to be perfect. Understand that the real business you are in is the MARKETING business. Again, get the FREE DVDs here.